We have reached Week 7 and it has seemed like a blur as the NBA season is roughly a quarter of the way finished. If you’re looking at the standings and your team is towards the cellar, don’t panic just yet. Perhaps injuries have wreaked havoc on your squad and you’ve been unable to see your team at full strength or maybe you own some colossal disappointments that have contributed to the misfortune. On the flip side, just because you’re at the top of the standings doesn’t mean you can relax and coast your way to victory. Exploring the trade market is an excellent way to improve upon your weaknesses so be sure to closely examine your standings to see the logical areas of your team you can upgrade. We are far enough along in the season where small sample size should no longer be an issue for the vast majority of players so make sure to take advantage of the opportunities out there. With that being said, never make a trade just for the sake of change. The end goal of every trade is to make your team better so be sure the trade accomplishes this. For those who tuned in for the the Week 6 edition, buy low recommendation Chandler Parsons has really taken off as of late with 26 points per game over the last three games. Additionally, sell high guys like Tyson Chandler have cooled off while Andrew Bogut (knee) is again donning suits on the bench thanks to his injury. What a surprise. If you were able ship any of these oft-injured studs off or trade for Parsons/Batum, would love to hear about your deals in the comments sections if you so choose. Without further ado, let’s start the Week 7 edition off by expounding upon return of the Pizza Guy. While Thomas missed eight consecutive games for the Phoenix Suns, he returned for the Suns game on Friday against the Detroit Pistons. He scored 10 points with two rebounds and two assists on 3-11 FG in 28 minutes. Obviously it wasn’t an amazing effort from IT2, but the minutes were encouraging and some rust is to be expected after a lengthy layoff. Once he gets more comfortable on the court with his ankle injury, it’s going to be smooth sailing for owners. For starters, even though he is being used in the sixth man role, his 27.5 usage rate this year is higher than the 25.8 usage rate he saw last year as the starting point guard for Sacramento Kings. According to NBA.com/stats, his usage rate is actually a top-20 mark in the NBA for players with enough games to qualify so it certainly appears his early production will be sustainable based on his sizable role in the Suns offense. Although he is nearly averaging five less points per game from a year ago (20.3 PPG), IT2 is playing nearly 11 less minutes per game on average compared to last year (34:41 MPG) so his 15.1 PPG is rather impressive. 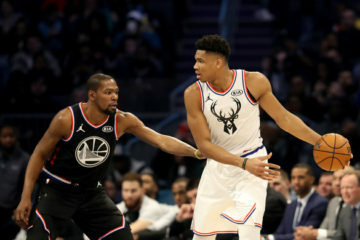 The 25-year-old is a perfect fit for the uptempo offense the Suns play and while his upside remains capped due to the presence of Eric Bledsoe and Goran Dragic, Thomas was ranked higher than the Dragon prior to his unfortunate ankle sprain and he certainly can post top-50 numbers from here on out. Obviously if either of the aforementioned guards were to miss an extended period of time due to injury, Thomas’ value would dramatically increase with a starting role. The career 86.1% free throw shooter is hitting a blistering 90.1% from the charity stripe this year, good enough for the sixth-best mark in the NBA. 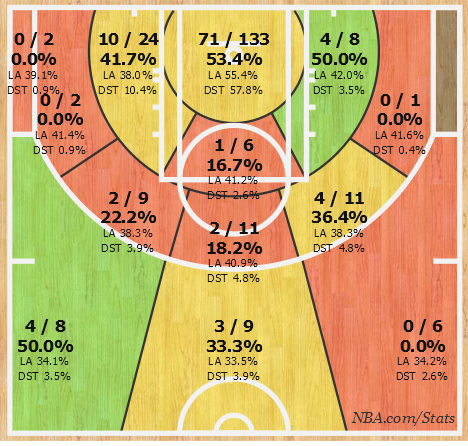 The Pizza Guy is also nailing 1.4 threes per game at a 37.1% clip, which would his second best percentage of his career from deep. It may take some time for him to get rolling as he knocks off the rust from an 18-day layoff so be sure to send out some trade offers before he starts making a lot of buckets as usual. 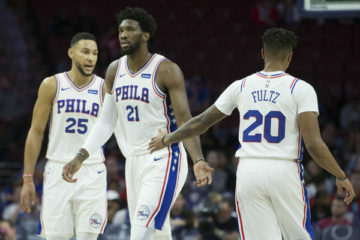 While Young was a fantasy sensation last year on an abominable Philadelphia 76ers squad as he went on to post career-highs in points (17.9), 3PM (1.1), and steals (2.1), the success hasn’t exactly translated for him since joining the Minnesota Timberwolves this yea. His outing on Wednesday was a disaster as he shot 6-20 from the field and 0-5 from the three-point line as he finished with 13 points, marking the seventh straight game he has failed to reach the 20-point plateau. As it stands, his field goal percentage (43.9) be a career-low figure while his rebounds (4.6) and free throw percentage (61.7) would represent the second-worst marks of his career. Looking at his shot chart this year compared to last gives one a pretty good idea of why Young is struggling for efficiency so far. Check them out below. 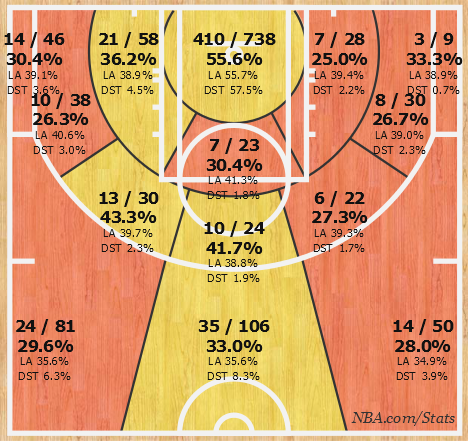 Young is currently going through an extended shooting slump and look for his field goal percentage to creep closer to his career mark of 49.8% as the season wears on. Young recently missed time due to the unfortunate passing of his mother and this has likely contributed to his early season struggles and one can only hope being on the court can alleviate some of the pain he’s feeling. Our thoughts and prayers go out to him. His recent production has left something to be desired for fantasy purposes and owners should exercise patience if possible as he’s likely to get going in short order. Further helping his cause for him bouncing back fantasy-wise is the fact that Ricky Rubio, Nikola Pekovic, and Kevin Martin all remain out indefinitely with their respective injuries and Young will be asked to shoulder the scoring load until their arrivals back to the hardwood. The 26-year-old got back on track last night as he hit 8-of-15 shots for 16 points to go along with five rebounds, one steal, and one block. Even though he is only returning 12th-round value at the moment, a nice buy low window has presented itself to acquire Young as he still possesses plenty of upside and it likely won’t cost too much to obtain him. While Sullinger was struggling in the two games prior to his game against the New York Knicks last night, he laid a disastrous goose egg for owners yesterday as he went 0-of-6 from the field for zero points, four rebounds, and one assists in 21 minutes, his second lowest total of the season. He clearly hit rock bottom in his lousy outing against the Knickerbockers and over his last three games he’s only averaging 3.3 points and 5.3 rebounds on an abysmal 4-of-21 shooting (19 percent). While the aforementioned tidbits aren’t exactly flattering for Sullinger, he’s just mired in a mini-slump and should go back to producing monster lines in short order. Even with his recent struggles, he’s still providing fifth-round value as the 58th-ranked player in 9-cat Yahoo leagues. Other than his lackluster free throw percentage, Sully is establishing career-highs in every standard fantasy category and there’s no question he’s been one of the best draft day values based on his 113.1 Y! ADP. Sullinger has shot 75.6% from the charity stripe in his career so owners can safely pencil him in to finish around that area when the season is over with. After lighting it up from deep in the preseason and then struggling with his 3-point shot early on in the season, 22-year-old Ohio State product has honed in from deep as of late. Over his last 15 games, Sully has hit at least one three in 12 of the games and is shooting 42.1% (24-57) from behind the arc during that time. 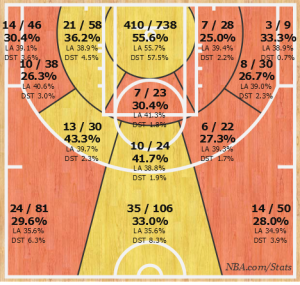 He’s hitting at a 36.1% clip from deep on the year and his development of a reliable three-point shot is just another boon to his fantasy value. Owners should brush off this mini-slump as a minor blip in the radar and continue to treat him as a top-50 asset as he was humming along with top-40 value before three recent poor performances. If you find an owner out there who believes this is the beginning of the end for him, swoop in and steal him off their hands for a discounted price. He’ll be worth it. Beal is coming off a season-high 29-point outing to go along with three rebounds, four assists, three steals, and four 3-pointers against the Los Angeles Clippers last night and I can’t help but think this is the perfect sell high opportunity for Beal owners. The 21-year-old possesses a boatload of talent but is still struggling to turn that talent into everyday consistency as owners can attest. Over his last 10 games, he’s scored 25+ points twice but has scored 15 or less in the other eight contests. While he can light it up from three-point range and is averaging a career-high 1.3 steals, his box score production leaves something to be desired. Beal tends to be a bit of a boom-or-bust player and as long as that trend continues it will be extremely tough for him to obtain top-50 value due to his inefficient high-volume shooting from the field. To his credit, he is knocking down shots at a career-high 44.6% clip, but it will likely regress as he’s a career 41.8% shooter. Furthermore, while Beal is certainly an above-average three-point shooter, he’s unlikely to keep burying treys at a 49 percent clip considering he’s hit 40.3% of shots from deep in his career. He’s not quite Kyle Korver yet. Additionally, after posting a 24.4 usage rate as a second-year player last year, Beal’s usage rate has fallen to 21.7 this season. It’s not a huge difference but it’s certainly enough of one to affect his output as his field goal attempts are down as well (15.7 >12.8). Another reason to sell high on him is due to his designation as an injury-prone player. 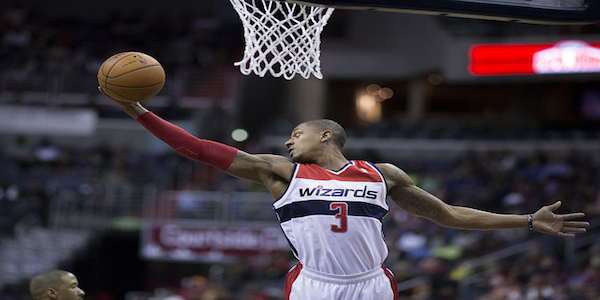 He missed nine games earlier this year due to a broken wrist and prior to this season he had only played in 129 of 164 possible games for the Wizards which equates to 78.7%. If you add in the nine missed games this year that means Beal has only played in 76.3% of their regular season games. At some point the talent will outweigh the injury concerns, but his inefficient ways right now combined with his propensity for injury make him a prime sell high guy. You likely won’t be disappointed if you unload him for a more consistent option. While Big Al is still putting up some decent numbers so far this season for the Charlotte Hornets, his production is down in many fantasy-relevant categories and owners should take advantage of his recent strong play and name value in trade talk to try to unload him for a player with more upside. Check out the table below to see the differences in his box score output. As you can see in the chart, his minutes, points, rebounds, assists, field goal percentage, and steals are all down from a year ago with the Bobcats. His free throw percentage has been lagging as well considering he’s a career 71.3% shooter from the free throw line. Jefferson’s drop in field goal percentage and rebounds have to be the most worrisome trends for his current owners. His 47.9% mark from the field would be a career-worst figure while his 8.1 rebounds would be his lowest mark since the 2005-06 season. Ouch. Jefferson has also seen a slight drop in usage rate (29.7 > 28.5). The presence of Lance Stephenson likely has something to do with both his drop in rebounds and usage rate but there’s no doubting Big Al hasn’t been a walking double-double this year like he has in years past. If you can trade Jefferson for the likes of Serge Ibaka, Nikola Vucevic, Al Horford, Markieff Morris, or Tim Duncan, I’d be all over that. Thanks for reading and thanks to Yahoo and NBA.com/stats for the statistical information. Be sure to comment below with any questions or remarks you may have concerning the article. You can follow me on Twitter @MattMoczy and I’m more than willing to answer any questions. 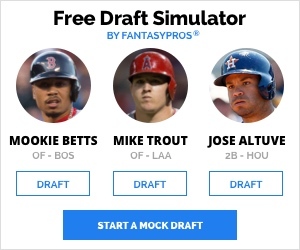 I'm a 23-year-old who just graduated from Texas Tech and I'm obsessed with fantasy sports, specifically fantasy baseball, basketball and football. You can follow me on Twitter @MattMoczy and I'm more than willing to answer any fantasy-related questions you may have. What’s up Matt I’m back again with some more questions . Is trading rondo/Howard and picking up a top ten player (cp3/curry/Lebron/ cousins ) worth it? I’ve been feeling like it is worth it because I could 1. Pick up a player that can contribute well enough to make it seem like I never lost anything 2. play the waiver wire incase a hot free agent came up . Im not exactly sure if rondo / Howard is the combo I should give up or not.. With these two horrific free throw shooters do you think I should completely tank free throws ? I also see you think Jefferson should be sold as well so I’m just interested in A. If you think I should be trying to 2 for 1 and B. What 2 for 1 I should be going for . Last week you told me I could use an elite big man or forward so I got Jefferson for a very cheap price . Do you think I should 2 for 1 for Lebron ? Appreciate your blog and what you do! Trading Rondo/Howard for a top-10 option would more than likely be worth it in my opinion. Their upside is severely capped due to their horrendous marks in FT% and I’m sure it’s taking a toll on your team. Other than Rondo/Howard, the rest of your squad actually looks like pretty dang good in FT% so trading both might benefit you in a big way as long as you don’t sacrifice too much in the other categories. You have the right thinking regarding your proposed 2-1 offer b/c if you can get the stud and pick up a good FA you’ll be just fine. In your case, I’d definitely be trying to make a 2-1 deal. If you could get LeBron for Rondo-Howard I’d do that in a heartbeat. Sweet thank you for the advice , if the Lebron owner doesn’t budge who would be the next two I should go after ? Dieng, Kaman, Williams is how I would rank them in terms of priority for a pickup. Hey Matt , so things have kind of changed , I acquired kawhi for Asik and affalo . And now since rondo was traded to Dallas and Howard is back im conflicted . Both of the two have been playing really good and posting good %’s.. I have a chance to acquire Kevin durant for the two but I’m not sure , I don’t have a lot of WW talent but smart is on there.. What do you think I should do ? Wow idk how you got Kawhi for Asik-Afflalo but well done. I’d trade Rondo-Howard for KD in a heartbeat. 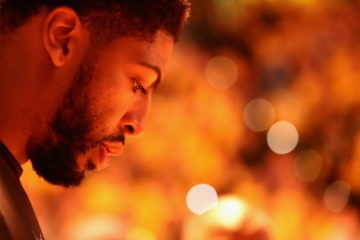 He’s the best or second best (Brow) player in fantasy basketball when healthy. Howard/Rondo will still wreck your FT% and it’s unlikely Rondo will post the same gaudy numbers in Dallas due to the Mavs being a more talented team. Hey Matt, should i hold on to McDaniels and TJones? I also have BroLo and Rubio injured atm. Im leaning on dropping TJones for Gobert or DLee.. Or should i tough it out and wait on TJones even with my other injuries? 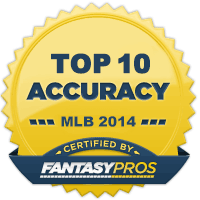 Doing well in the rankings but im going against the top teams the next few weeks. I know fantasy is a marathon and not a sprint but is it still worth to hold onto Jones with Motiejunas playing great next to Dwight? Although Terrence Jones still doesn’t have a clear timetable to return, I would try to hang onto him thanks to his major upside. He was posting top-20 value before he got injured and when he gets back to the court he should be a shoo-in for top-50 value at worst. While David Lee should be owned, I wouldn’t be crazy over spending a waiver on him as he’s likely going to come off the bench behind Draymond Green and hamstring injuries can be easily aggravated so I see Lee as a risky fantasy option. Furthermore, while Lee provides good PTS-REB-AST-FG%-FT%, his upside will be limited due to his lack of defensive stats for a big combined with the fact he likely won’t see more than 25-30 MPG off the bench, if that. While I love Rudy Gobert and would like to see the Jazz unleash him due to his outstanding 1.7 blocks per game in only 17 minutes, head coach Quin Snyder has shown no inclination to stick him with the starters even though Enes Kanter is horrible on the defensive end. Gobert should have nice some short-term value thanks to Derrick Favors ankle injury but from the early prognosis it doesn’t sound like Favors’ sprain is too serious and likely won’t miss more than a couple games. While Lee-Gobert-Wright should be owned, I’d have an extremely tough time dropping either McDaniels/Jones for them based on their enormous upside. With the Mcbob news and Bosh out. Is Shawne Williams now a must own? Should I part with McDaniels for him who only got 20min tonight. I could also drop McDaniels and claim DLee. Big big help Matt. Thank you very much for the analysis. Williams is definitely worth a pickup if you’re in need of 3-pointers but his upside is limited and I’d rather own McDaniels still due to his versatility. Btw, dont you think Gobert has the same upside as TJones with his FG%, rebs, stl, blks potential? He might get more PT too as the season progress. Look, I’m really high on Gobert and he’s going to be a beast in the starting lineup for as long as Favors is out, but when Favors returns Gobert will likely shift back to the bench. He SHOULD get more PT as the season wears on but there’s no guarantee he will. Unless he remains in the starting lineup indefinitely at some point, Jones still possesses more upside. I’d like to include Rondo but I haven’t had many takers on a 1 for 1. Any suggestions on what I should do in my std. H2H league? Should I pursue a trade or roll with my team? Any suggestions would be great! If you’re not having much luck on Rondo, I’d also consider seeing what you can get for Dwyane Wade. His health issues make me hesitant to rely on him too much and with Bosh looking at an extended absence this could be a nice time to sell high. He will put up gaudy numbers when on the court, but his propensity for DNP make him a headache to own. It’s hard to answer those questions without more info pertaining to your league like your place in standings, strengths/weaknesses, etc. With a quick glance at your roster though it looks like you could use some help at F position with Amir struggling and Bosh injured.